Awesome work by everyone involved! AnnaMay, you look beautiful! Jen, how many times have I told you NOT to make me cry? That is the most AMAZING frickin' costume. And AnnaMay could not possibly look more fabulous in it, especially with that beautiful ear-to-ear smile. Epbot community ROCKS!!! So much like for a fabulous costume! I hope she wears the heck out of it, and loves every moment! Wow! What a wonderful group of people on here! Awesome! She looks so happy! AnnaMay, you're a doll! You're amazing. She is amazing and completely WONDEROUS!!! Makes me a happy old lady nerd! I think i'm most excited that you got to SEE it in PERSON! How fantastic to see this beautiful teamwork come together and see the results in person. I'm happy for you Jen! Awesome story. And to Brooke, Teka and you, you all ROCK. I think that the internet is a village sometimes and we know it takes a village to raise a child. Rock on with your bad self AnnaMay, you look wonderful! Way to go Jen, Teka and Brooke! Wow! What a wonderful story! :) Really touching and inspiring! It took me awhile to get through this post. I couldn't read through the happy tears. This is such a heart warming and touching story. Thanks Jen for bringing the people together who could help Amazing AnnaMay! SQUEE! It all looks so great together! I admit I was a bit worried about the boots fitting perfectly, but yay! they worked! Thanks so much for taking such beautiful photos of everything all together! I very rarely get good photos from people after something leaves my sewing room. May I use some of them on my blog? Thanks, Jen, for all you do to make the world smile! Oh and thank you again Brooke! You ROCK!! Of course you can, Brooke - use anything you like! 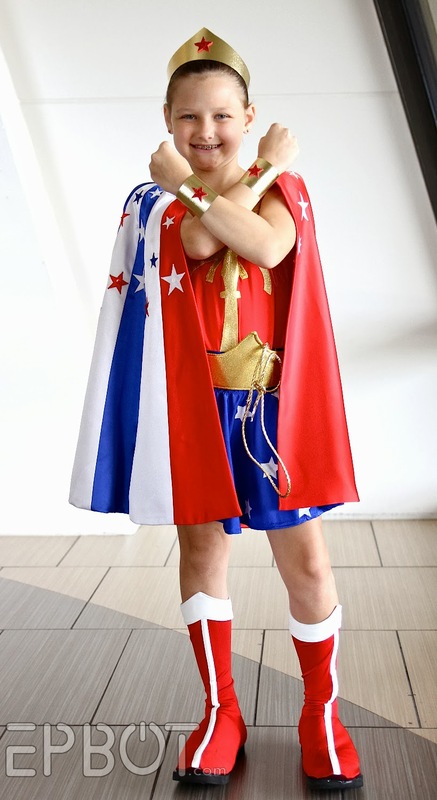 AnnaMay IS a Wonder Woman, and so are you and everyone else who made this great costume to show the world just how wonderful this sweet child is. Rock on, all you SuperFriends! This is so great- wonderful costume work, and I'm so impressed with the attention to making sure all the parts were comfortable and acceptable to AnnaMay. Awesome work, and what an example of teamwork and compassion. Absolutely EPIC! AnnaMay, you are super! Beautiful! The cape is gorgeous. AnnaMay - rock out with yo' bad self with your costume. 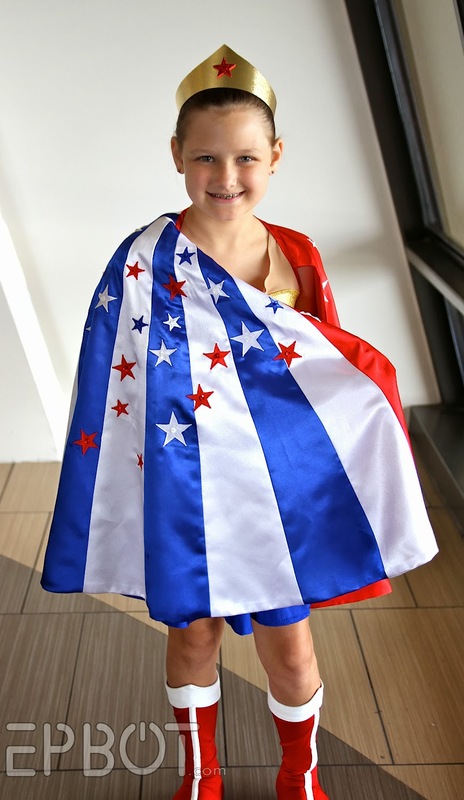 I live in Asheville, NC and people wear capes on the street, like at fairs and other events. Interesting and liberal town. She shouldn't be afraid to be who she is. I was (and am) an intense Mozart Geek and was made fun of it relentlessly. I stuck to my guns and still love my Motzie. :) Don't let other people dictate to you what you like!! Oh my gosh oh my gosh oh my gosh!!!! What an amazing costume! It looks fantastic on you, AnnaMay. 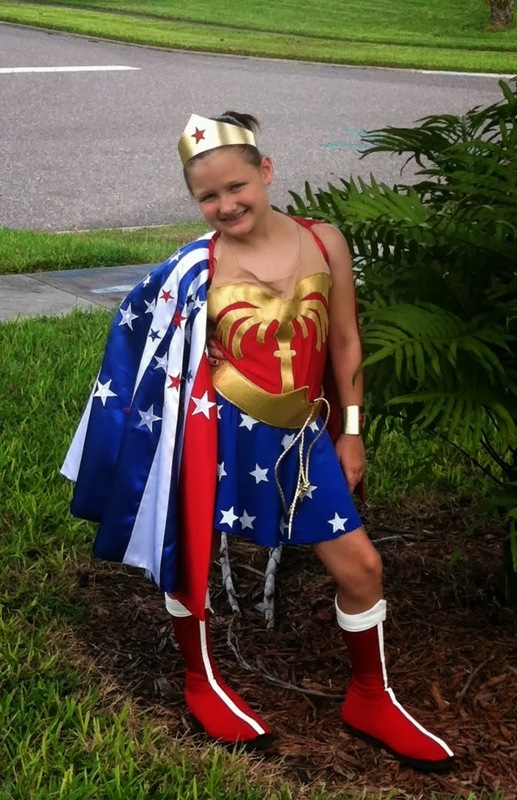 I have a niece who is 32 years old and she is totally into Wonder Woman. She would be so jealous of you in that costume. What a WONDERful lady you are. I love it! AnnaMay, I know it's hard when other people make fun of you for the things that are closest to your heart. I've been there too, and it hurts when they can't--or refuse to--see just how awesome our interests are. Something I tell myself when I feel this way is "Those who mind don't matter, and those who matter, don't mind." 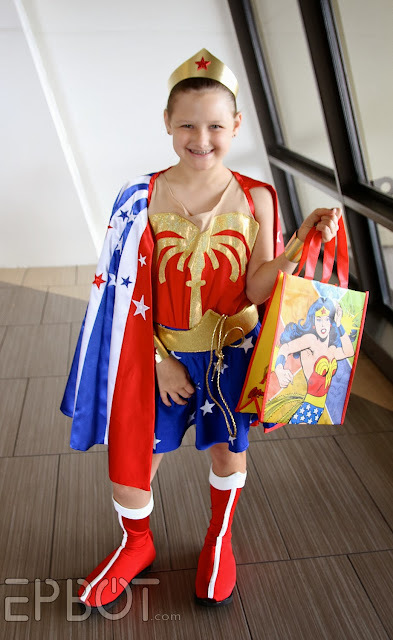 Hugs to you--you are a terrific Wonder Woman! That is a fabulous costume! AnnaMay, you look Wonderful! Jen, thank you for bringing people together to inspire and encourage kids in pursuing the geeky side. These stories are truly great! 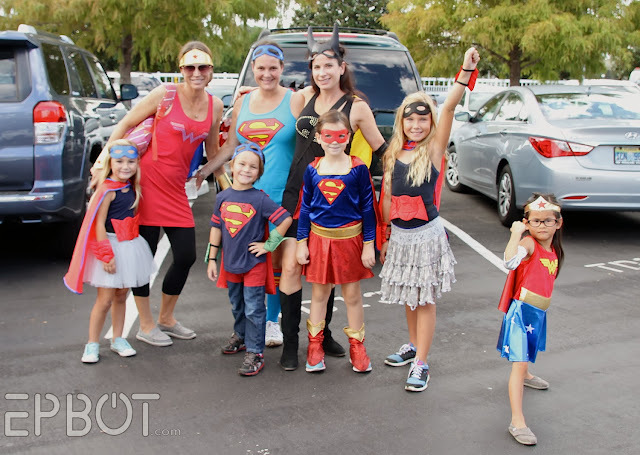 Fabulous costume, ladies! I'm sure AnnaMay felt proud. :D Here's to letting our geek flags fly!! What a terrific story! So happy!!!! Any time I meet a geek girl or a Mom of a geek girl, I tell them about Epbot. This is why. The costume is amazing AnnaMay is awesome, and her Mother is wonderful. Saying nothing of the awesomeness that is Jen Yates. This was the perfect ending for my day. Wooohooo for everyone!!! Aww! This is awesome. Just freaking awesome! Everyone that was involved, YOU'RE AWESOME! lol Such a feel good moment. AnnaMay, you are a wonderful girl. You like what you like and don't let anyone make you feel bad about ANYTHING. They're just trying to make themselves feel better by tearing you down. Please remember this: people only have power if you LET them...don't LET them. It won't make sense now, but as you get older, it sure will! Teka, Brooke and Jen, thanks for letting this special girl shine. well done, in every way, by everyone. This is incredible. You look awesome, AnnaMay! That costume is totally gorgeous, but I think AnnaMay's smile overpowers it. You keep rockin' whatever you like, AnnaMay. I'll be cheering you on. But really, that is just amazing. Your fan base coming together to support someone who needs it. I would rather have non stop allergy flair ups reading these articles than depressing ragey ragers reading the news. This made my day! AnnaMay's happy smile is the best! The second I saw the way the cape fastened I just thought, Brilliant! I can't stand things that feel like they're constraining my neck and I don't even have a sensory processing disorder so I bet that's a huge boon for her. I'm tearing up, just reading about this. So many people coming together to help a total stranger in the most amazing way! Absolutely lovely- all of it. I just finished watching the news. I don't know why I watch the news. Negative, negative, negative. This cheered me up oh so much! Thank you so much for sharing! 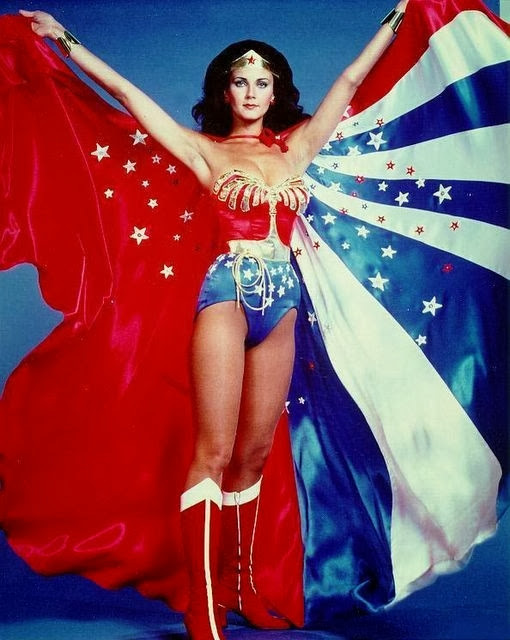 Wonder Woman is my fave too! Look at that smile! You guys did a wonderful job - congratulations! As the mom of a son with anxiety disorder and SPD, I am sooo touched that everyone involved understood what was needed. Ok, getting all happy-teary over here. What a great group of geeks coming together to encourage one another! Jen, Brooke, Teka, ya'll are amazing. 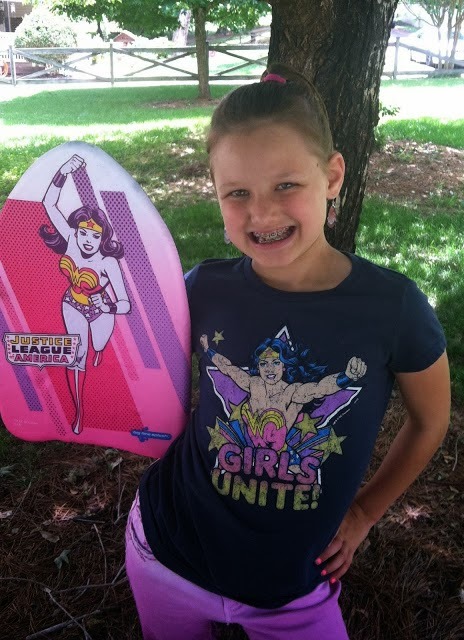 And AnnaMay, you keep rocking your geekiness! Don't be afraid to be who you are, because you are awesome, just the way you are. Don't let anyone tell you different! Such a wonderful story! It left me in tears! <3! AnnaMay is such an inspiration to girls everywhere! Aaaaand now I'm crying happy tears! You go, AnnaMay! I love you and all that you do for your readers. I have recently come to realize that I am letting my anxiety control me and take over my life. I have decided that I do not want to live in my cave any longer. I want to live. Period. And it's people like you, doing what you do that remind me I can do this. GO ANNAMAY!! Such a wonderful story -- it brought tears to my eyes! Its so great to see AnnaMay so happy in these photos and what y'all did for her! After a rough day in the retail world, its good to read such an inspiring story! Crying all over the place brb - and I love that pic of you and Buzz! :D You look so young and vibrant! Thankfully that you both inspire us as much as we hopefully inspire you! i have been away for two weeks and havn't had Epbot to read... what a wonderful story to come back to. i have only got comfortable with my geekyness in the last few years and experienced some anxiety while i was away about my introverted personality... this community has helped me to except me for me and it warms my heart to see the wonderful support for someone who is young. AnnaMay is amazing and looks great in her costume. thank you Jen for helping people (including me) to embrace their true selves! Fabulous costume! AnnaMay is a perfect little Wonder Woman! Oh, man. 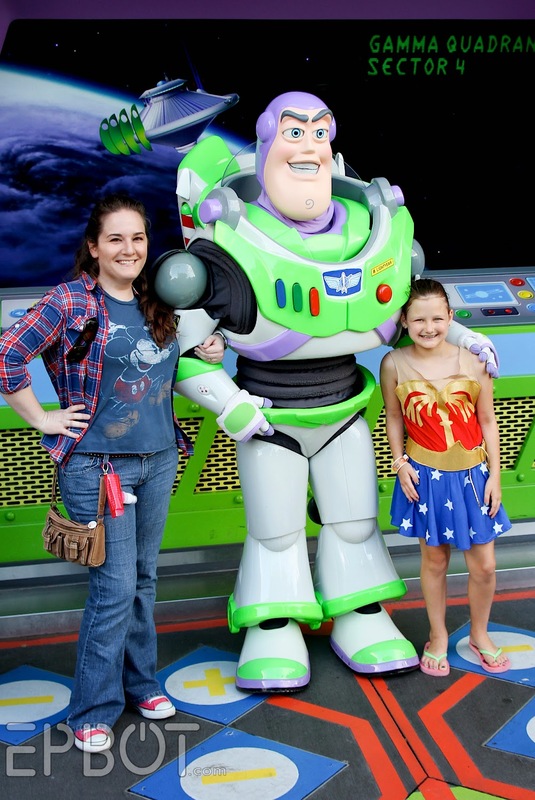 I started crying when I got to the picture of you and Anna May with Buzz! Thanks for creating this awesome online community where we can all feel comfortable being ourselves and encouraging each other! I think it is so great that these young girls like Anna May can have support and encouragement to work with their social anxiety that was harder to come by when I was a kid! Brooke's blog post you linked to did mention that you made the accessories for the costume, judging by the picture that would be the crown, wrist cuffs and belt, and you never even mentioned it. I know you probably left it out because you didn't want to take away any light from the two wonderful people who made the rest of the costume and the cute little Wonder Woman, and you are not one for bragging, but you do have every right to brag: those details you added made the costume really stand out. *Tears* !!!!!!!! Love how awesome your readers are! I think someone must be chopping onions in a classroom....yes...that must be it! Love! Lovelovelovelovelovelovelovelove! There is so much of that here. I'm so glad. Thank you!! AnnaMay, sweet girl, you be YOU. Be AnnaMay, no matter who that person is or what she loves. YOU are the ONLY YOU, let them be them and do whatever goofy normal thing they think is cool. The people who are cool enough to be your friends will find you and love you for you and for all the things you'll have in common. All the coolest people who ever lived, including the guy that created Wonder Woman, were/are people who were themselves and lived their life their own way that made them happy, no matter what others thought or said. Normal is common and boring; weird is wonderful! YOU BE YOU. Yeah, the so-called Normal People in this world can beat it; it's the Weirdo Nerds of the world that rock, and care so much about each other, though we may be strangers, enough to want to work this hard just to see another nerd be so furiously happy. You all make me proud to be One of the Tribe. You look absolutely awesome, AnnaMay! Jen, you and your readers restore my faith in humanity. Thank you for being you! Oh wow that looks amazing. And I may have to steal Teka England's trick with the mesh some time. Fast forward almost four years.... How is AnnaMae doing now? What does she think of the new movie? I'd love to see an update on her!